T-SQL Quiz 2011 is ON! This month, we will exercise some gray cells. The T-SQL Quiz 2011 is now in progress, and I hope that by now, all of the T-SQL fans amongst you would have visited it. So, how can I start? Well, you start by visiting the T-SQL 2011 Quiz URL – http://beyondrelational.com/quiz/SQLServer/TSQL/2011/default.aspx – and then clicking on each day of the calendar to look at, and answer the question for that particular day. That’s not a problem. Each question is open for a period of 30 days, so you have plenty of time to research, learn about and then answer the question. This is the most interesting part – rewards! The first prize is an Apple iPad sponsored by Redgate Software! 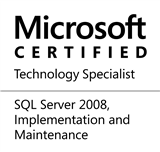 This entry was posted in #SQLServer, Blog, Imported from BeyondRelational and tagged #SQLServer on March 12, 2011 by nakulvachhrajani.